Scott Hitchens poses with his Blades HVAC Services car at Georgetown Speedway last year. Last month, Scott Hitchens competed in the Super DIRTcar Series Big-Block Modified features in Charlotte, N.C. Racing is in Hitchens’ blood, having inherited his love for speed from his dad, Greg. He first raced go-karts for about four years, traveling along the East Coast, as far as Florida, to compete, before moving up to asphalt racing. Hitchens has won approximately 80 to 100 of the races in which he’s competed. He said races normally have a minimum of 25 cars competing but could have up to 50 cars. Now, as a dad to a little girl, Hitchens said he has scaled back his time devoted to racing from six nights a week to two or three. “I’ve got a lot of guys that help me, which take a lot of it off of me,” he said. “You get [to the track] and everybody gets out on the track and packs it in because it’s all messy. Then everybody goes out and has a practice session to make sure everything is alright. “Then you go out for your qualifying race, your heat race. It’s a short race. Where you finish in that determines where you start in the main race. Once you finish that, you go back in and work on your car, get lined up for the main event and then go race that. Just working on the cars themselves is a fun aspect of racing, said Hitchens. 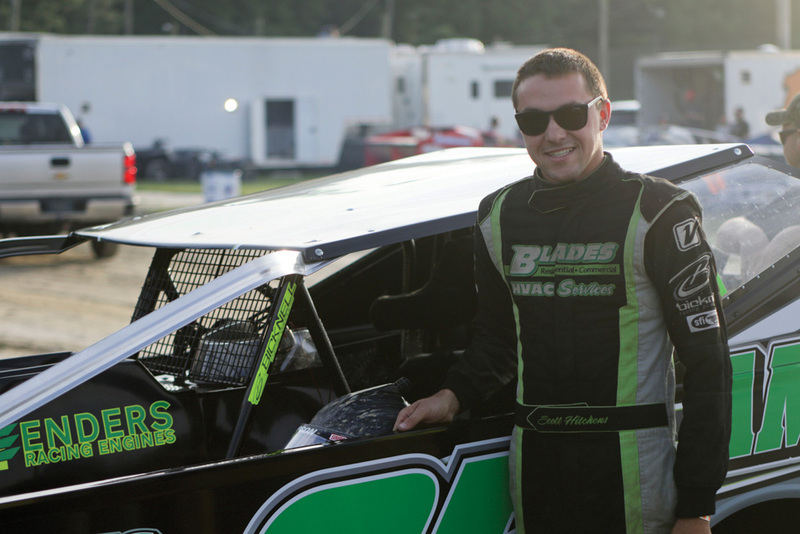 Hitchens races a car owned by Brandon Blades of Blades HVAC Services. While Hitchens didn’t win the World Finals in North Carolina, he said it was a thrill just to be part of the race. He and his team hope to qualify for the World Finals again next year. Hitchens said he was grateful for the support of his dad throughout his nearly two decades of racing. As for racing, Hitchens said he enjoys the adrenaline rush and the taste of competition.